Minions is now officially available for Minecraft 1.4.2. Minions is a unique yet important piece of modification that allows you to have small workforce (peasants) working for you. Minions can help you building by gathering/mining materials and resources such as Stones, Woods and Diamonds. They follow your every command and don’t let you down. 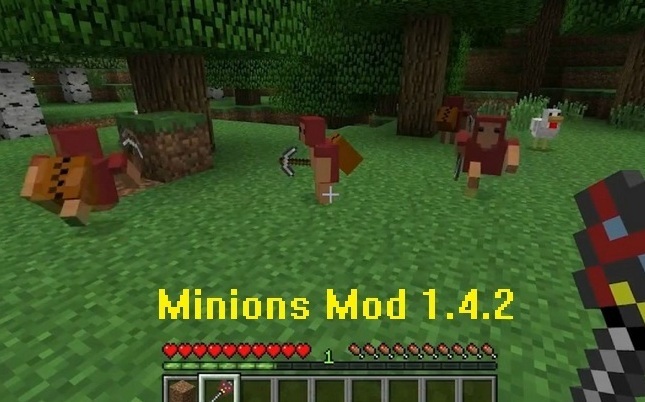 Description: Adds Minions in your Minecraft world. Minions Mod Guide & Tips. Left-click Minions for working incentive. Left-click with Staff out for evil sparkly. • Run Minecraft and play! * Please make a back-up of your Minecraft saves/install before installing any kind of modification. * Follow the installation instructions carefully, if you are having any trouble, please report in official thread.